Bridgers & Paxton designed the mechanical, electrical, plumbing and technology systems for the new construction, HMC-130 Fuel Cell Maintenance Hangar, Armament Shop and Corrosion Control Facility at Kirtland Airforce Base. 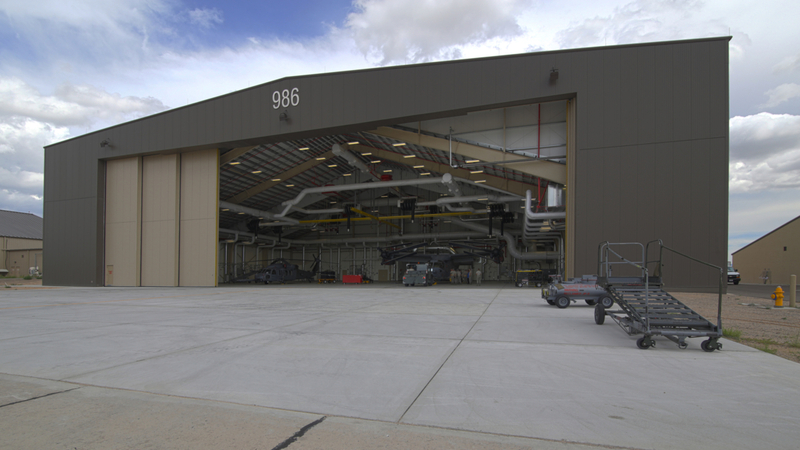 The 32,208 SF H/MC-130 Fuel Cell Facility is a one-story facility with a hangar bay sized for the H/MC-130 aircraft, offices, locker room, breakroom, and a dispatch office. The Hangar also has space to support new mission training, recapitalization and aircraft beddown for HC-130 and MC-130 aircraft flown by the 58th Special Operations Wing (SOW). In addition, the 10,760 square foot Armament Shop houses a facility to service weapons systems in aircraft flown by the 58th SOW and transient aircraft. The shop also includes a weapons vault, offices, administration, training, and workshop areas. The new facility is designed to store limited quantities of Explosive Transport Class Division 1.4, Compatibility Groups C&S, and explosive devices. Additionally, the project included an addition to an existing 3,438 SF Corrosion Control Facility that provides capabilities to accommodate repair of composite components associated with the recapitalization of the legacy H/MC-130 to the newer J-model H/MC-130. The CCF also includes a clean space, dirty room, transition room and facility support infrastructure space.